NextBuild is a set of Windows applications glued together to create a single integrated development environment for making games and programs for the Sinclair ZX Next computer. 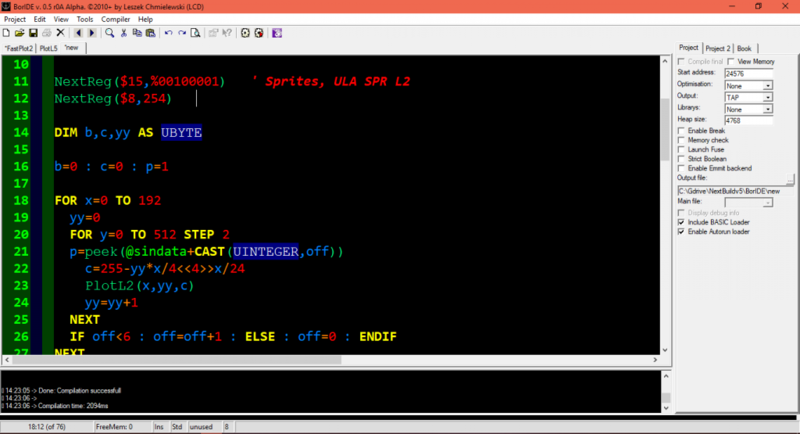 It can also be used to write software for the normal ZX Spectrum but the focus is for the Next. NextBuild is intended for beginners and pros alike, its easy enough to pick up with little or no experience yet powerful enough to keep the more experienced devs interested. The goal of NextBuild is to simplify software development and reduce time spent debugging and testing. The idea is to keep is simple! So Nextbuild requires no installation and is a one-click run program! Boriel’s ZXB – by Boriel – A Windows/Mac/Linux compiler that uses a variation BASIC. The files are edited on your host machine and then compiled into machine code. ZXB allows the use of inline assembly and inclusion of user define libraries. FUSE – by Fuse Team – A classic ZX Spectrum emulator for when you want to write normal ZX software. NextLibs – by David Saphier – The all important include that opens up ZXB to access the Next’s hardware features. NextBuild also supports post compile options that help automate repetitive tasks, such as copying files to your Next, renaming files or executing any custom batch commands you may wish to run. See this page for more links and info on the tools included. The most important thing is to enjoy yourself and have fun! em00k on Things are still moving! les greenhalgh on Things are still moving!